Jen, from Gricefully Homeschooling, and I team up, the first two Fridays each month, to bring you great FreeBEEs...on both of our blogs. PLUS...with the added bonus of this being a monthly link up...where you can showcase your freebies, things you've found online, and also, things you've received in the mail, totally FREE this month. Hopefully you grabbed the great resources from both Jen and I last week! These FreeBees are still available so be sure to grab them. Remember that we are changing things up this year so we are only posting our FreeBEE posts the first two Fridays each month. The first Friday of every month, we will be providing a link and a savings code for you to get a FREE product from some of our favorite homeschool companies. These great sponsors are offering these *Limited Time FreeBEEs* of lapbooks, unit studies, online classes, and more to bless homeschool families (you the reader)! The second Friday of every month we will have our Homeschool FreeBEE Friday Link Up. So our favorite bloggers can link up their FreeBEE posts! This link up will be open through the rest of the month...so instead of a weekly meme this will be monthly, now. Did you play with paper dolls when you were a child? I know I did! 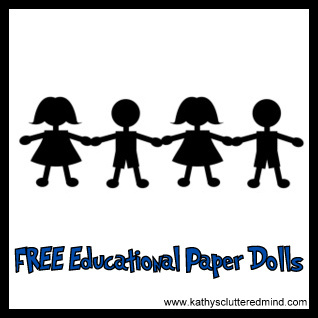 Have you ever used paper dolls in your homeschool? Well if you do that's awesome, if not you should try it. Paper dolls are great for enhancing geography and history lessons as well as including some art too! Here are several FREE websites I found where you can get FREE printable paper dolls. While your at it learn about the history of paper dolls at The Original Paper Doll Artists Guild. and lower the cost of consumable materials. seems to work speak to your dermatologist for any advice or try a different acne skin care product.